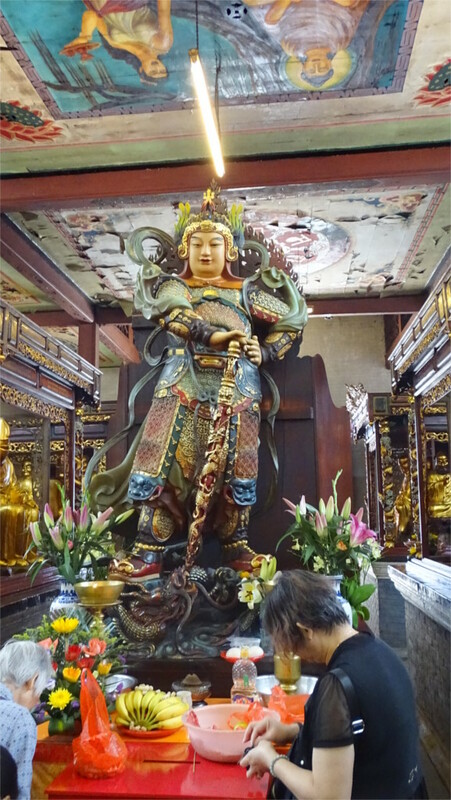 Even now, when I think back to our visit to the Hualin temple in Guangzhou, I remember the hall of the 500 arhats. It is only when I look my photos that I recall the many other beautiful objects that I saw. 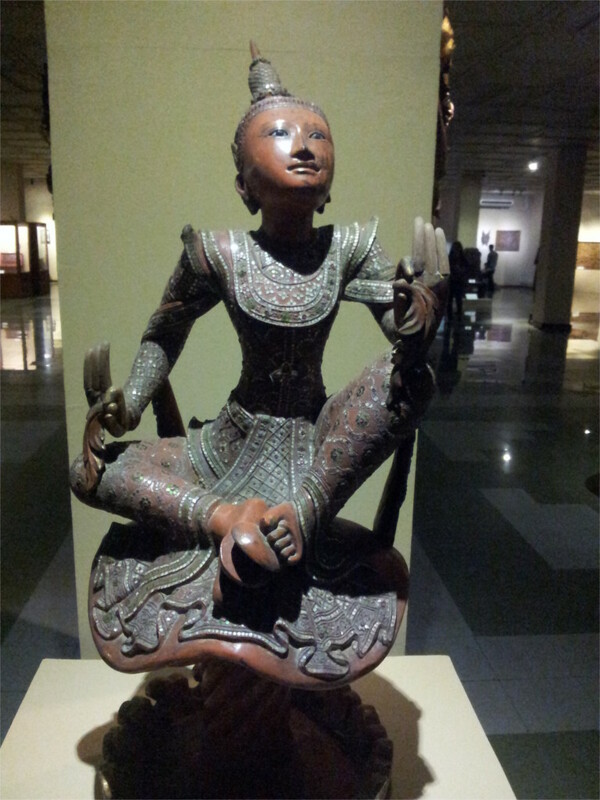 It is amazing to think that almost every beautiful object was recreated a couple of decades ago. 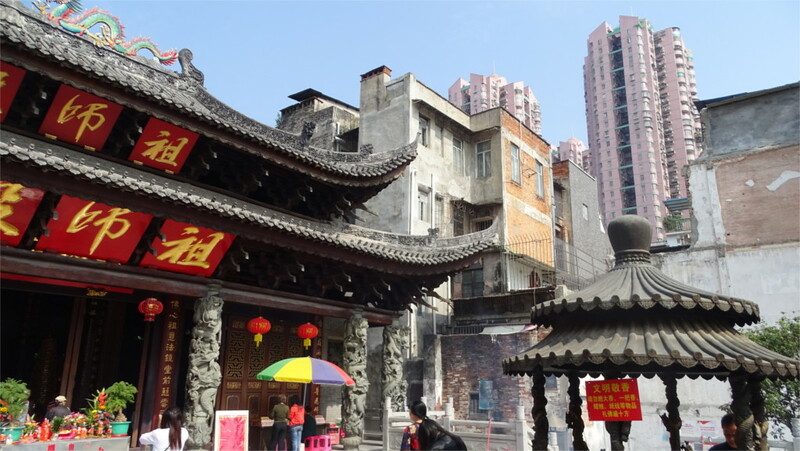 The temple was originally founded in 526 CE, possibly in the lifetime of Bodhidharma, who brought Buddhism to China, extended massively in the 17th and 19th centuries CE, destroyed in the Cultural Revolution, and reincarnated in the 1990s. We peered into the side galleries. The gallery was a modern building made of cinderblocks. The industrial look was softened by the beautiful decorations over the doors, one of which you can see in the gallery above (click for a slide show). 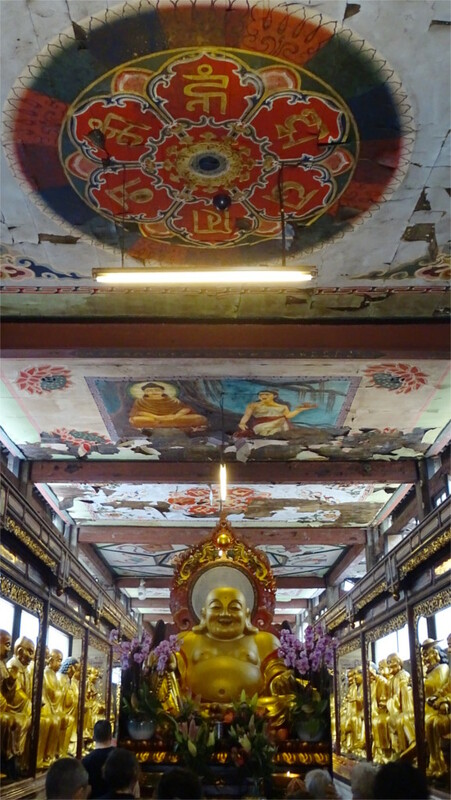 The rooms hold different Bodhisattvas and Buddhas. 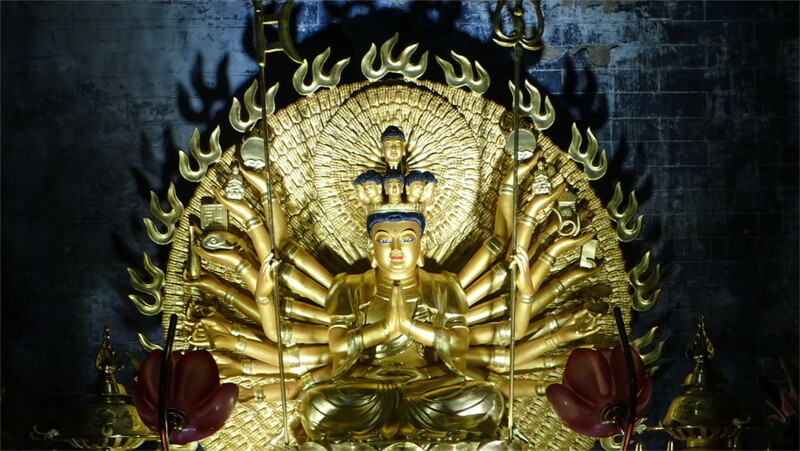 I’m not adept enough at Chinese Buddhist iconography to figure out which statue is whose. The rooms are beginning to fill up with memorial tablets. Notice the money in the hands of the statues. Donations of this kind are very common. The surroundings of the temple were interesting. 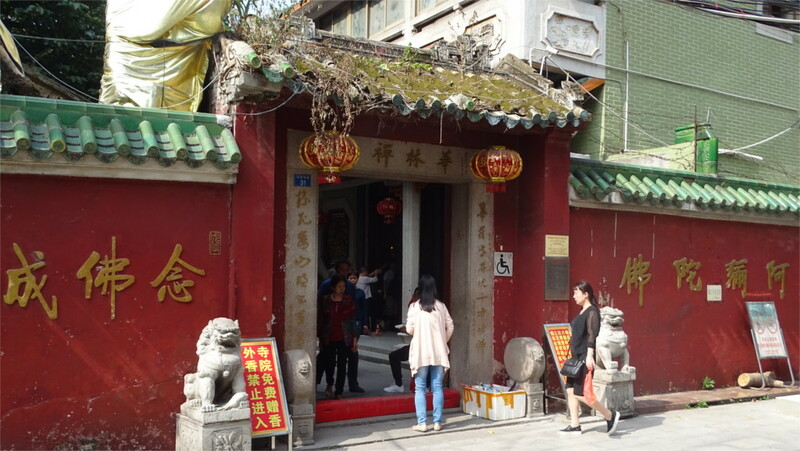 This was a temple which seemed to have been completely integrated into the neighbourhood. It was only through later reading that I realized that during the Republican period a part of the temple grounds had been sold off to create housing. The view that you see in the photo above shows that these housing blocks are now being destroyed, and the new high-rises are replacing some of them. The Chinese government is planning forward to a time when a quarter of a billion people leave villages to come to town, but the building projects have drawbacks. That is a different story. 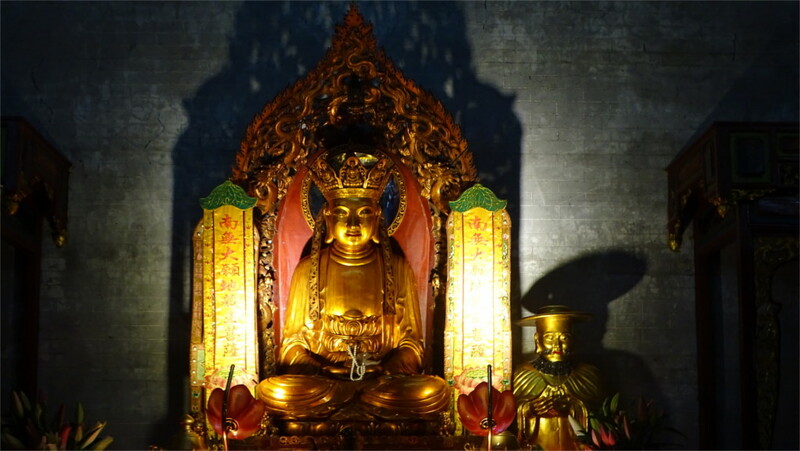 The large pavilion in the center of the courtyard is a calm place, unlike the hall of the arhats. This means, of course, that it is not as important from the religious point of view. But it gave us the leisure to walk around and admire all the art on display. The beautiful pieces tell you that traditional arts are alive and well in China. I’d met artists working in ceramics on earlier visits: there are wonderful new glazes being invented (you see one them in the peacock vase in the gallery above). The strong men holding up the base of the central statue are beautifully detailed, the tigers which roam the pediment snarl gracefully. There is clearly a renaissance in the arts. 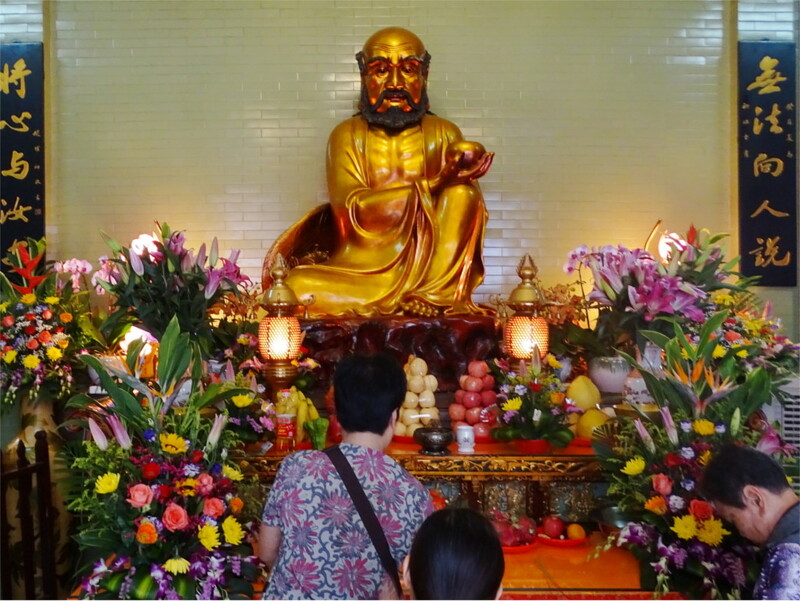 And what of Bodhidharma, the wandering monk who founded Chan (Zen) Buddhism? He is so deeply forgotten in his country of birth that we don’t even know whether he was from Persia or the south of India. But in his karmabhoomi he is deeply venerated. The first statue we saw when we entered the temple was his. He is always depicted as a wandering monk, sometimes with a begging bowl, sometimes with a staff, but always bad-tempered. 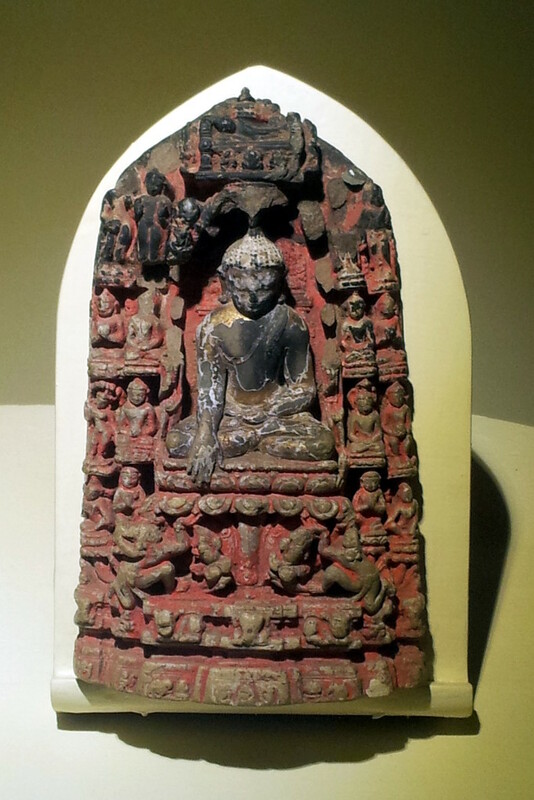 Zen Buddhism is not known as a gentle or easy path. If you are a teacher, have ever been one, consider again this superstar: always in a foul mood, but so influential that, after one and a half millennia, nearly a billion living people are influenced by his teachings.